Four of MF Husain’s paintings were to be shared with the public after many years at the 3rd India Art Summit, the country’s largest art fair. 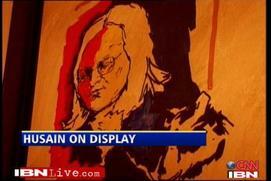 By evening of Day 1, the Delhi Art Gallery was forced to take off the paintings by the organisers. Both parties had received numerous threats by individuals and groups that believe Husain is anti-Hindu and anti-national. Ashish Anand, Director, Delhi Art Gallery said, “We have received around 20 odd emails from various groups – from Bombay and Pune and so has the India Art Summit. So they are fearing that there could be a stampede and so they are wanting the safety of the people. Even the Police Commissioner told me that it is perfect, like there is no problem, there is enough security at the summit. We are still in touch with the organisers so there is still a possibility that we may be able to show Hussain’s paintings. Controversy that started in 1996 over his depictions of Hindu gods peaked in 2006. The artist not only had various cases against him but was given numerous death threats by right wing groups. Living in exile since 2006 and and now a Qatar national, the artist has not returned. Whether it is the gallery, the organisers or the art fraternity, the general sentiment has been one of sadness and helplessness at showcasing India’s biggest star. India is still scared to display his works; can the government help? We could show Turner’s art all year round – but would the spectacular watercolours then be rendered everyday? 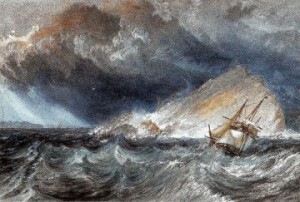 ‘WE ARE SO unaccustomed to be remembered in such matters, and receive so few public presents of such magnitude, that we can scarcely realise our claim to recognition in the disposal of the national benefaction.” This is how The Irish Times reported the news of Henry Vaughan’s bequest of 31 Turner watercolours to the National Gallery of Ireland on January 6th, 1900. Ever since, each January, the watercolours have emerged like flower bulbs from the darkness of storage to bloom gloriously for their one month of public display. They all repay viewing, but the most dramatic piece is A Ship Against the Mew Stone, at the Entrance to Plymouth Sound , painted around 1814, of a galleon in full sail tilting into a stormy green sea with dark blue clouds roaring above it. This year, for the first time, Vaughan’s specially-made oak cabinet in which they are stored the rest of the year, is also on show. It occupies a central place in the dimly-lit room. The watercolours now on display fit into wooden panels, which in turn slot into racks, all concealed behind doors. “We try to have a different theme each year, and this year it’s conservation,” explains curator Anne Hodge. “So we thought it would be interesting for people to see the cabinet Vaughan had made for the watercolours.” This year the exhibition is entitled Colour and Light: Caring for Turner’s Watercolours. The watercolours held in Dublin are but part of the bequest Vaughan made. He also bequeathed 38 to the National Gallery of Scotland, in Edinburgh, and 23 to the National Gallery in London. Hodge outlines the terms of the bequest: that the watercolours were to be displayed in January only; that they were to be shown together; and that the exhibitions were to be free. The custom-made cabinet held at Dublin is apparently the only one of the original three to survive. Vaughan’s reason for stipulating the watercolours be displayed only in January, when daylight is weakest, was to protect the colours from fading. In 2011, and for many years modern technology has meant the watercolours could be displayed year-round without any danger of damage. So why aren’t they? “We stick to the condition of the will,” Hodge says. It’s early on a weekday morning, yet the print gallery in which the Turners are on show has a very sizeable crowd of people constantly moving through it. What do these visitors think: would they like to see the watercolours on show year-round or do they prefer the fact that they can only be seen in January? “If they were on show all through the year, we probably wouldn’t come to see them at all,” says Sam Hutchison, who has come specially to see the watercolours. Noel Doyle and Eric Lidwell, who are both art students, have come specifically to see the Turners for the second year running. They have the same response as other visitors when asked if they’d like them to be exhibited all year. “You could see them all year around, because we can do that kind of thing now, but because they’re only here in January, there’s a heightened interest in them,” says Doyle. You are currently browsing the Indian Art Blogs blog archives for January, 2011.